Posey is my sidekick, if a girl can have a sheep for a sidekick. When I open the gate, she is the first to greet me. When I walk by the fence, she trots over to baaa a hello. When the ram gets annoyed with my presence, she quietly comes and stands between us, preventing any aggressive, “rammy” behaviour. 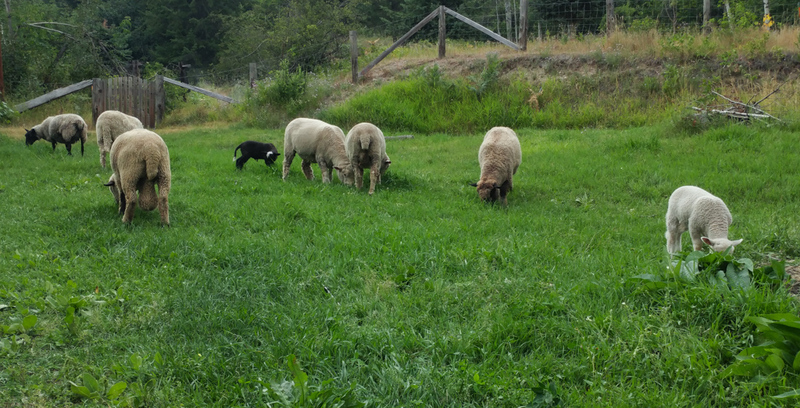 Posey is our alpha ewe, and it seems the other sheep follow her lead. If she trusts you, the rest of the flock will…well, flock around you. She has always enjoyed a good massage on her shoulders or hind legs. The kids and I discovered that if we are extra quiet when we pet her, she even seems to fall asleep standing up! Posey, a triplet, was born in April 2014 to a Delaine merino dam and sired by a Rambouillet merino. 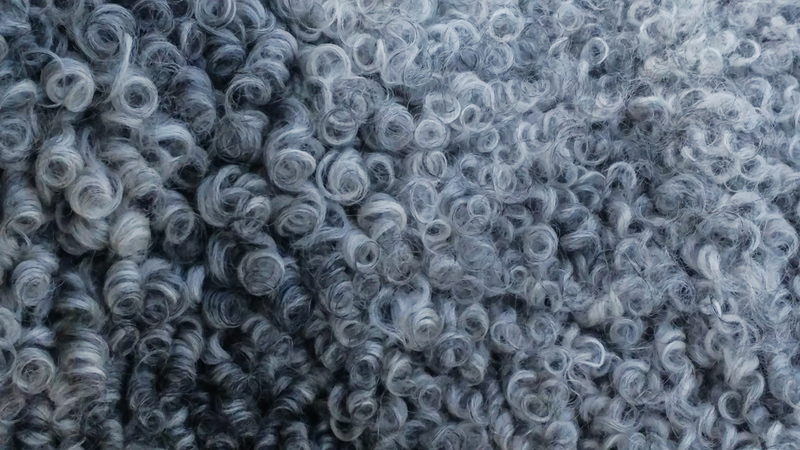 Her fleece is a beautiful white that takes dyes wonderfully and is a dream to spin and knit. In 2016 she easily lambed our first newborn on the farm, a chocolatey ram lamb we named Yarrow (sire was Romeo, a purebred Romney). Posey was a wonderful mama and took to her duties with admirable devotion. Now, Posey is set to lamb again in February and we can hardly wait! Flora is Posey’s sister and the beauty queen of the flock with her movie star mole over her lip. Flora was born in April 2014, one of a set of triplets to a Delaine merino dam and a Rambouillet merino sire. Flora has wonderful mothering instincts and “adopted” our youngest ewe, Stella Blue. Like a true diva, Flora chooses when she’d like to walk up to you for a little petting. But mostly she is a lovely ewe, and along with Sugaree and Posey, Flora makes up the original trio of our flock. Like her sister, the twin merino ewes have stunning white fleeces that make the softest of wool with a very low micron count (measures the diameter of the fibres…the lower the micron count, the finer the wool which increases the value of the fleece). Flora has lambed twice on our farm, and both times she excelled at her mothering instincts, birthing easily to one big ram lamb each time. In 2016 she lambed Aspen (sire was Romeo, a purebred Romney) and in 2018 she gave birth to Huckleberry. Both boys remain with us today. Aspen is our current stud on the farm. 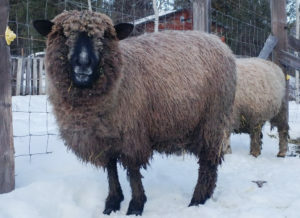 He is a handsome gentle giant, with a most impressive chocolatey brown fleece that turns a silvery charcoal at the base. He was born on our farm to Flora, a Delaine x Rambouillet dam who was bred by Romeo, a purebred Romney. Aspen has the perfect combination of ultra soft Merino fleece with the longer staple length of a Romney (50% Merino and 50% Romney). He is a big boy but like most Romneys, he is mostly a teddy bear of a ram. We all giggle at his “old man”, hoarse baaaas that greet us whenever he sees us approaching. 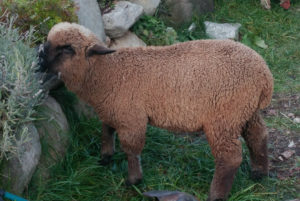 Huckleberry is Flora’s second ram lamb, born in the spring of 2018. 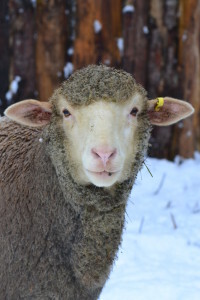 Because of his genetics,we decided to “wether” Huckleberry to keep him as a fleece grower, unaffected by the cyclical surge of hormones that rams experience. He lives with the girls and is a little shy with humans, but if you are patient, he may tiptoe up behind you for a little tug on your shirt tail. Huckleberry is the spitting image of his father, Aspen, though his fleece is more like a chocolatey Merino while Aspen’s wool is longer. His fibre is 75% Merino and 25% Romney. Sugaree is an aloof ewe who prefers to keep her distance from people. She was our first sheep to arrive here from a less than desirable place but her potential as a gorgeous fleece grower was apparent and we were so happy to welcome her home. Today, she is robust and energetic, happy with her flock and especially with Clover, the guardian dog. Sugaree was born in April 2014 and she is an interesting cross of 1/2 Rambouillet Merino, 1/4 Cotswold, and 1/4 Romney. 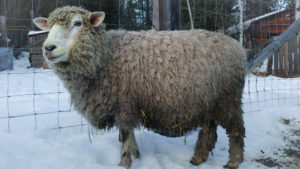 Her fleece is exceptional with long white locks that have a shimmery lustre. Sugaree lambed twins in the spring of 2016, Samson and Delilah. Sugaree and her daughter are still often side by side, grazing or lying beneath the apple trees. Sugaree is due to lamb again in a few weeks and it certainly looks like there are twins in there! 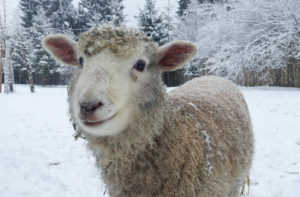 Delilah is quiet and shy around humans, but she likes to frolic and play with the other ewes in the flock. She was born in the spring of 2016 along with a twin brother, Samson. Delilah has a gorgeous fleece that grows in a characteristic Romney fashion ~ long locks that can obscure her vision unless we trim around her face. 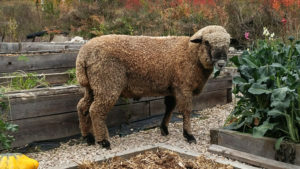 Her sire was Romeo, a purebred Romney ram and together with her mother who is 1/4 Romney, Sugaree is 5/8 (62.5%) Romney with 1/4 (25%) Rambouillet and 1/8 (12.5%) Cotswold. Her fleece ends up being creamy in colour with a little silvery mocha mixed in. 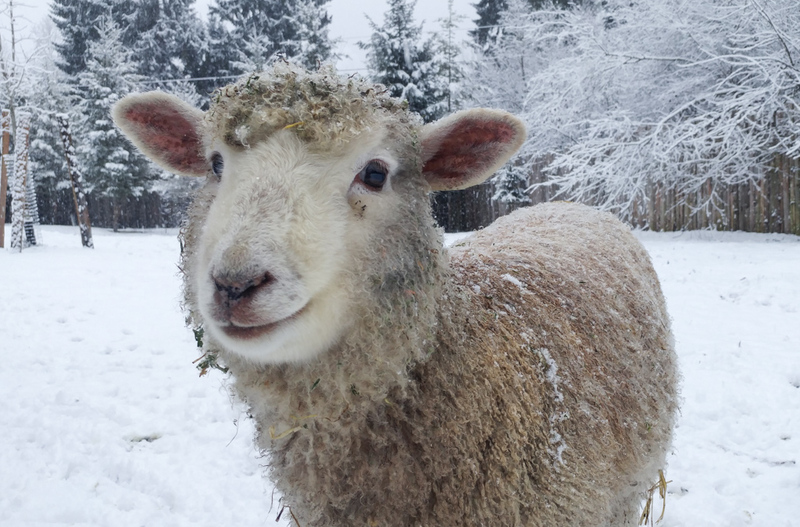 Stella Blue is one of the most endearing sheep we have. She arrived in 2015 to Gladsheim Farm as a young ewe lamb and little did we know how much of a personality she has in such a small frame (in comparison to the large Merinos). She is predominantly Gotland as her sire was pure Gotland while her dam was 1/2 Shetland and 1/2 Blue Faced Leicester. Stella is very approachable and I swear she is more like a puppy than a sheep! 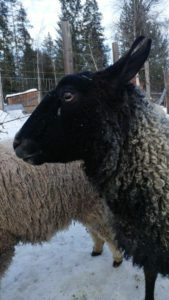 She enjoys massages and scratches under her chin, and though she is the smallest ewe at the farm, she is not to be pushed around. Stella has lambed twice, once in 2016 to a ram lamb and then again in the summer of 2018 to a beautiful pure white ewe lamb, Little Luna. Stella is a loving mother who continues to watch over her nearly grown up daughter. 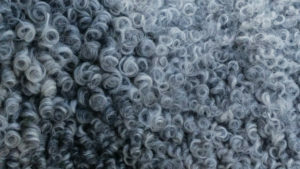 Stella’s fleece is gorgeous with ringlets that are silvery, charcoal grey and creamy white. She truly is stunning! 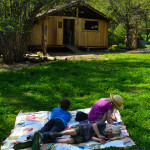 Little Luna, or Lilu as she is affectionately called, is the storybook lamb. She is snowy white with pink ears and large hazel eyes. 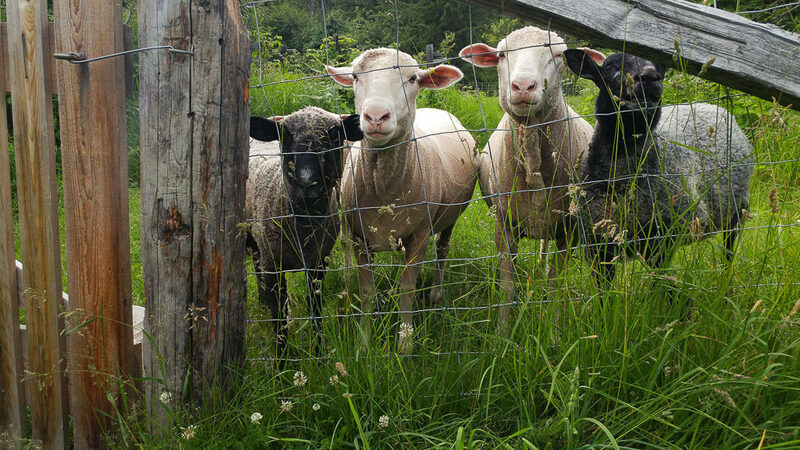 Like her mother, Stella Blue, Lilu happily greets any human that walks through the gate with a friendly baaa hello. She is inquisitive and gentle and always wears a smile on her face. Little Luna’s sire is Aspen who is 50% Merino and 50% Romney. 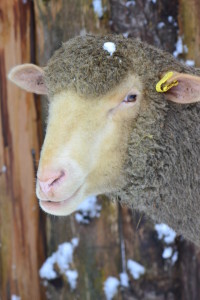 As her mother is Stella Blue, Lilu is therefore an interesting mix of 25% Gotland, 25% Romney, 25% Merino and 12.5% each of both Blue Faced Leicester and Shetland. When you see Lilu’s abundant long locks with an amazingly tiny crimp of snowy white fleece, her fine fibre background is obvious. Little Luna’s fleece is a prize and it will be exciting to see it after the first shear. With lambing due to begin any day now, our flock is growing. We are expecting four or five new lambs around Valentine’s Day so stay tuned to see who will join us!